We Would Like To Express Our Gratitude. As the holiday season gets underway, The John’s Island Foundation would like to express our gratitude to all the donors in our community who have made our work possible. On December first, Foundation President Jim Johnson and his wife Sandy hosted a reception for Leadership Circle donors (those whose gifts were $5,000 or more). On January 30th, the Annual Donor Reception will be held at the Golf Club starting at 6pm. The reception is funded by our generous sponsors to date: The Hill Group; The Law Offices of John E. Moore, III; and Mercedes Benz, Porsche, Audi of Melbourne. All current donors (those who have contributed between 6/1/15 and 12/31/16 will be invited to attend. This past year we have been able to award more than $550,000 to fund capital projects for 21 charitable agencies in Indian River County. One of the agencies supported by the John’s Island Foundation is The Learning Alliance This agency was established in 2012 with the goal of having most third graders in Indian River County reading on grade level. JIF was able to contribute $50,000 to buy educational equipment and books for their resource library and pre-kindergarten learning program. Thank you all for supporting John’s Island Foundation. We hope that you will consider joining one of our site review teams in the coming year to learn more about the needs of our local community. The John’s Island Foundation is proud to announce the officers for the 2016-2017 season. 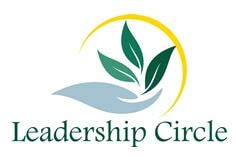 Each of these board members brings substantial experience and proven commitment to the Executive Committee. Many thanks to the preceding officers for their hard work and accomplishments over the past three years. Since 1999, the John’s Island Foundation has given over $9.2 million for the capital needs of charitable agencies in Indian River County. This year we have 25 agencies requesting funding which totals over $800,000. These requests include: Tables, chairs, office furniture and building renovations for Crossover Mission; transforming a traditional classroom into a learning lab at the Wabasso School for the Education Foundation; and, Bedbug resistant bedroom furniture and bedding for the Samaritan Center. The John’s Island Foundation is unique. We raise funds solely through your donations. We do not sell tickets for events, nor do we raise revenue from parties or benefits. Please consider supporting the Foundation through which many well vetted and deserving agencies are served. The Foundation will recognize the Leadership Circle members in our annual report and celebrates this elite group at an exclusive cocktail party. a generous outpouring of support! The past fiscal year again proved the generosity of the members of the John’s Island Community. The John’s Island Foundation received $733, 975 in contributions from 558 donors, compared with $686,600 from 546 donors the previous year. This represents a 6.9% increase in donations. To those who donated last year, please accept our most sincere thanks. During the 2015-2016 review year, we awarded twenty eight capital grants to non-profit organizations who provide essential services to those who live in Indian River County. Some of the items we funded were new flooring for a senior center, a complete kitchen and food pantry renovation for a homeless shelter, 3-D software w/printer and a 12 passenger van for an afterschool youth program which will provide transportation to students to and from the program who need it. We are entering in our eighteenth year and since our inception have granted over $9.2 million to more than 83 separate nonprofits serving Indian River County. Our success in making a difference in people’s lives is due to the generous outpouring of support from people like you throughout the John’s Island community. Although you may not be planning this far ahead, please give some thought to joining one of the John’s Island Foundation’s Site Review Teams next year. In January, each team usually visits three charitable agencies in Indian River County who have requested a grant for capital needs from the Foundation. The purpose of the visit is to evaluate the request and report to the Foundation Board how much of the grant, if any, should be given. You meet the principals of the charity and see firsthand what they do and who benefits from their work. It only takes a couple of hours for each visit. The John’s Island Foundation provides for only capital needs of charitable agencies in Indian River County and complements the work of the John’s Island Community Service League and United Way who provide funding for operations. 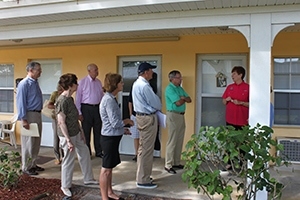 For example in 2010, The Boys & Girls Club donated a small house in Vero to Big Brothers Big Sisters. It became known as the “Little House” and is being used for one-on-one tutoring of over 500 children a year (4 to 18 years old). Their teachers have referred them because they lack pre-kindergarten readiness skills or have other academic or psychological problems. Since 2011, the John’s Island Foundation has contributed over $50,000 to this renovation, which is now complete. This month we are reviewing requests from 26 non-profit organizations in Indian River County totaling $800,532 to fund their various capital projects. Since we don’t have the funds to support all these requests, we will need to make some hard choices this month. A final determination on funding decisions will be announced by the board on March 18th. One example of the type of capital funding requests we receive is from Childcare Resources of Indian River. This agency was established in 1994 to support economically disadvantaged families in our county who work full-time, go to school full-time, or a combination of both. These families make too much to qualify for state or federally supported childcare programs (earning about $30,000 to $40,000 for a family of 3, for example). 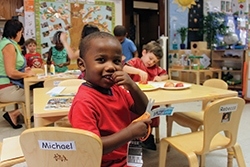 Childcare Resources’ goal is to provide quality child care and preparation for kindergarten and beyond. Last year, we provided Childcare Resources with $50,000 to build a classroom for two-year-olds in their new Education Center, where the agency currently leases 3,800 square feet of space in the former Doctors’ Clinic at 2300 Fifth Avenue in Vero Beach. This year, they have requested $35,794 to furnish the classroom and stock it with age appropriate learning materials. The above photo represents an existing classroom of older children at the Center. We would like to continue helping the local charities we feel are well-run and providing needed services in our county. Please consider making an additional donation this year to John’s Island foundation. This year there are twenty-six non-profit organizations from Indian River County requesting funding from the John’s Island Foundation totaling $800,532. These requests are for a variety of capital needs and improvements. According to Jay Anglada, Grant Review Chair, site review teams are in the process of conducting comprehensive agency visits, determining which organizations will receive funding. There are ten teams consisting of a Captain and three to four team members. This year’s Captains are: Judy Anglada, Jerry Babicka, Carol Critchell, Charlie Dill, Rob Elliott, Lou Hoynes, Jim Poole, Bill Sayler, Jim Smith and Steve Trooboff. In order to get a complete understanding of how each non-profit serves the needing population of our community, they will meet and visit with the leadership of the assigned organization and thoroughly review the appropriateness of each request in detail. Once completed, the teams will then present their recommendations to the John’s Island Foundation Board. The John’s Island Foundation is unique in its mission to provide grants for capital improvement of deserving charities here in Indian River County. This financial support complements other funders like the John’s Island Community Service League and the United Way who provide operating dollars to many of the same non-profits. For example, this year the Alzheimer & Parkinson Association has requested $21,339 for new flooring in their center; the Gifford Youth Achievement Center has requested $50,000 for hurricane shutters, a PowerPoint projector and a Smart Board; the Homeless Family Center needs $16,990 for a replacement air conditioner and a generator; and, the Education Foundation has asked for $35,695 for computers for the Wabasso School. Last year, they were awarded funds to purchase seven Smart Tables, which are wonderful learning tools for those children who are struggling in the classroom. If you haven’t already supported the Foundation, it isn’t too late to contribute to make a lasting difference in our community. John’s Island Foundation (JIF) has begun its 16th year of philanthropy with a great group of returning officers and directors pictured left. Back row, left to right: Jay Anglada, Jim Poole, Art Scutro, Carole Parks, Jerry Sheehan, Dottie Currie, Julie Parker, Don Dussing and Mark Earle. Front row, Left to right: Ken Wessel, Jim Johnson, Mary Jane Somers.